Two known species, the following of eastern North America, the other of Europe, Asia and northwest America. Type species: Convalaria bifolia L.
Maianthcmum canadense Desf. Ann. Mus. Paris 9: 54. 1807. 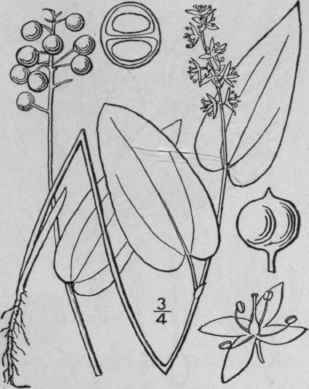 Smilacina bifoiia var. canadensis A. Gray Man. Glabrous or pubescent. Stem slender, erect, often zigzag, 1-3-leaved (usually 2-leaved), 2'-7' high; leaves ovate or ovate-lanceolate, l'-3' long, acute, acuminate, or blunt and cuspidate at the apex, cordate at the base with a narrow or closed sinus, sessile, short-petioled, or the lowest sometimes with a petiole 1/2' long; solitary leaves of the stemless plants on petioles l'-4 long; raceme rather dense, many-flowered, 1'-2' long; pedicels mostly longer than the flowers; perianth-segments oblong, obtuse, becoming reflexed, about 1" long, rather longer than the stamens; berry pale red, speckled, about 2" in diameter. In moist woods and thickets, Newfoundland to the Northwest Territory, south to North Carolina, Tennessee, Iowa and South Dakota. Ascends to 5000 ft. in Virginia. Cowslip. Bead-ruby. One-leaf. One-blade. May-July.